The SGT Report interviewed GoldCore’s Head of Research Mark O’Byrne over the weekend. The video was released yesterday evening and has already had over 5,300 views. Germans can’t get their gold reserves. Do how did the Dutch get their 122 tonnes of gold? Is Germany being prevented from holding gold to prevent independent foreign policy action? How humongous is a billion, a trillion and a quadrillion? Here is a transcript of the first 11 minutes of the 26 minute interview. SGT Report: What I wanted to do gentlemen is start with a headline that we rarely see and it's this one which I haven't written yet - "Strong dollar keeps gold prices low for Americans" and the reason I'm saying that is that according to your own blog at Goldcore.com, gold is up 14.3% in Japanese yen this year, 12.3% in euros, 5.8% in British pounds and of course only 0.4% when priced in dollars. And that's the real story, isn't it - gold continues to be real money and act as real money around the globe as fiat currencies are printed and annihilated. Mark O’Byrne: ABSOLUTELY and I think it speaks to the dollar-centric nature of the world today. We all look at things in dollars - not just in America, you guys do that naturally enough, but throughout the western world, particularly in the investment and finance sphere, the dollar is still king and everything is looked at in terms of pricing in dollars. That's created the perception that gold has been weak this year when in reality, it has been anything but. It's actually slightly higher in dollar terms ytd in 2014. So it's performed quite well versus other things, obviously not the stock markets which have roared ahead again but it has performed very well in all the other major fiat currencies. I think what we are seeing in terms yen and euro and pounds to a certain extent is a precursor to what we will see in terms of the dollar probably next year. We had the fall in 2013, I think this year we are seeing a consolidation, a bottoming-out process. I think it's also a function of manipulation, and we might talk about that in the course of the interview. But it's not just the major fiat currencies. It's very strong in yen, and they are debasing the yen in a huge way. And the euro - they haven't even started debasing the euro yet and there is talk that Draghi is going to start that in 2015 but it's up 12% in euro terms without them even starting QE in the eurozone. But even more importantly if you look to Russia, Ukraine, Syria and countries like that their currencies are being devalued in a very significant way and gold has gone up 30-50% in these currencies. 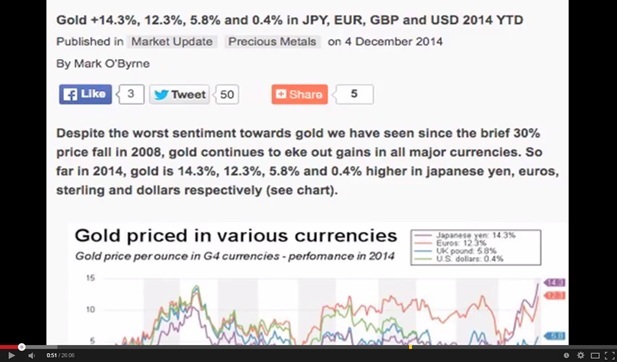 So it shows again gold is a safe haven asset, it is money. it has been throughout history and it is today. It makes a complete mockery of the idiotic and simplistic anti-gold propaganda in effect. The stuff that has come out recently, Willem Buiter from Citibank and others like Barry Ritholtz, a very prominent blogger who gets picked up and has a very prominent pulpit on Bloomberg. And these guys are coming out and attacking gold in quite a serious way and saying that gold is in a 6000-year old bubble and a whole host of silly, silly things. I mean even the 6000-year old bubble thing is ridiculous because there were no bubbles 6000 years ago because there were no markets. We've only had bubbles, big bubbles particularly, since the Federal Reserve in 1913, and particularly since Nixon went off the gold standard in 1971 - that's what has created really big bubbles. So there were no bubbles even 1,000 years ago. So it's important for people to realize that and to stay focused on that because there is a lot of propaganda that shakes people out positions. We have had a lot of clients selling in recent months and we tell them - and it's not in our interest to tell them - not to sell. As a dealer we make money when people buy and sell. But we have always said that if we do the right thing by our clients, we give them good advice, we tell them to hold for the long term, to own gold as financial insurance, we believe that they will appreciate that and we will get good word of mouth and they tell their friends and family and it is just doing the right thing by your client as well. SGT Report: THAT's right, and we try to do the right thing by our listeners and you read my mind when you mentioned propaganda because that is exactly what it is and that's why I wanted to lead with these facts. When priced in other currencies around the world gold is up a lot this year. Now what we hear from the mainstream mocking-bird corporate media in this country is that gold is a barbarous relic and stock markets are roaring higher. And the reason for this is that central banks are buying S&P futures to drive markets higher while they are simultaneously working in collaboration to suppress gold and silver prices. That's a fact. So it's pretty interesting to stand back at a 30,000 foot view and look at the facts and realise that despite the fact that they are trying to crush the paper prices of gold and silver, gold is still up half a percent when priced in dollars this year and that's only because the dollar has been surging. So why do we care about this? Why do we still talk about precious metals at this point? Well, as you noted in an article recently Mark, US DEBT HAS SURPASSED THE $18 TRILLION MARK, surging 70% higher during this "recovery" under Barack Obama. It's all an illusion of debt. Everything they're doing to create this recovery, a roaring economy, a roaring stock market is an illusion of bankster debt, period. Do you agree? Mark O’Byrne: I DO INDEED YES. I was shocked by - when I went into Google News to see how the - because when we hit $18 trillion debt I thought that could be a penny dropping for people and I thought some of the media might say "oh, wow, maybe the recovery isn't as strong as we thought" and there would be some interesting coverage of this but it was barely covered at all. Things have been quite Orwellian for a while but I actually think it's becoming more Orwellian and it's amazing that you could hit the 18 trillion number in terms of national government debt - it does not cover unfunded liabilities which are between $100 trillion and $200 trillion - so it's just incredible that this number would be hit. It's increased roughly $1 trillion per year under the Obama presidency, in this so-called ‘recovery’ and it's pure propaganda that it's a recovery. You can't have a recovery when the balance sheet of your nation is deteriorating in a massive way which is what is happening. And there is no reduction in debt, either the nominal national debt or the unfunded liabilities so it makes a complete mockery of the so-called ‘recovery’ meme that goes on. There are lots of other data points recently that suggests that the recovery is much, much more fragile and obviously a lot of the statistics are ‘hedonically adjusted’ and they are tweaked and manipulated to suggest that there is recovery but I think you have to question that. People get so jaded and so bombarded with numbers and they are almost blase about a trillion. They don't realize how big a trillion is. A trillion is a thousand billion. But they don't even realize how big a billion is. A billion is a thousand million and they don't understand how big that is. If you put it in terms of time that's a good way for people to understand it. So I actually pulled up the blog we did previously: a billion seconds ago was 1967, nearly fifty years ago. A billion minutes ago Jesus Christ was alive, back in Bethlehem and Jerusalem, 2014 years ago. A billion hours ago our ancestors were back in the Stone Age. So that's how big a billion is. It's a huge number and the U.S. debt increased $1 trillion in 1 year. SGT Report: AND THAT'S A THOUSAND BILLION! You're right. The numbers are so large. No-one can get their arms around them at this point. Forget talking to your friends, neighbours and colleagues about the $1 quadrillion dollar derivatives market. I've often said, and Rory and I and other guests have talked about the fact that I think, and I believe firmly that what's going on behind the scenes is far scarier and far more dire than any of us can possibly imagine as these banksters need to reconcile these numbers on a daily basis. Really, in fact, they are irreconcilable, even mentally, when you just consider the magnitude of the numbers. Can you even imagine having to be the DTCC and reconciling these high frequency trades at the end of every day? It's absolutely impossible and it's not nutty to say that. I just is true, even with the help of machines and computers. It's impossible to reconcile all of these trades because at the end of the day, in a fair and honest market, at the end of the 3-day DTCC SETTLEMENT PERIOD the paper certificates need to transfer to the new rightful owner. That's not happening. How can that possibly happen when you are talking about trillions of trades in a year. Now Rory, I know you've got some great questions to prepare for Mark so I want you to feel free to jump in at any point. Why don't we talk about the Swiss gold referendum before we pass it over to you because a vote against sovereignty and freedom is what this was and as Peter Schiff has summarized that the Swiss had hitched their wagon to the euro, a thought they once firmly rejected by refusing to join the European union. But they've turned their back on their own currency, but as you put it, Mark, and I agree, demand from India, Russia and china is far more important. And as I said before the referendum had even occurred it doesn't matter what they do, because we know the truth. And the truth is that central banks and nation states around the world are hoarding gold and acquiring gold as fast as they can. What do you make of the Swiss referendum vote? Do we have this right - it really doesn't matter? Today’s AM fix was USD 1,195.25, EUR 975.48 and GBP 766.73 per ounce. Friday’s AM fix was USD 1,204.50, EUR 974.28 and GBP 768.37 per ounce. Gold and silver were very strong last week and were up at 2.1% and 5.5% respectively. Despite the weekly gains, gold fell $14.90 or 1.24% to $1,191.40 per ounce Friday. Silver slid $0.17 or 1% to $16.29 per ounce. Gold is marginally higher today and testing resistance at $1,200/oz and is being supported by lower European shares following soft economic data from China and Japan and an S&P downgrade of Italy's credit rating. A much needed reminder that the Eurozone debt crisis may soon make an unwelcome return to jolt markets. Technically, immediate support is around $1,186, while on the upside $1,210-$1,220 will provide resistance. Hedge funds and money managers pushed a bullish position in U.S. gold futures to the highest level since August in the week to December 2, data shows. Holdings in SPDR Gold Trust, the world's largest gold exchange traded fund, rose 0.12% to 720.91 tonnes on Friday, though still close to a six-year low. Friday's payroll report pushed the U.S. dollar to a five year high which pressurised gold. Buying from Japan and particularly China offered good support to gold overnight. Silver was up 0.45% at $16.45 an ounce. Platinum rose 1.2% to $1,237.25 an ounce and palladium rose 0.4% to $807 an ounce.